Nursery Notations: Classic Children's Wallpaper is Making a Comeback! Classic Children's Wallpaper is Making a Comeback! I do love modern design for children's rooms but there is something so sweet about classic children's themes. 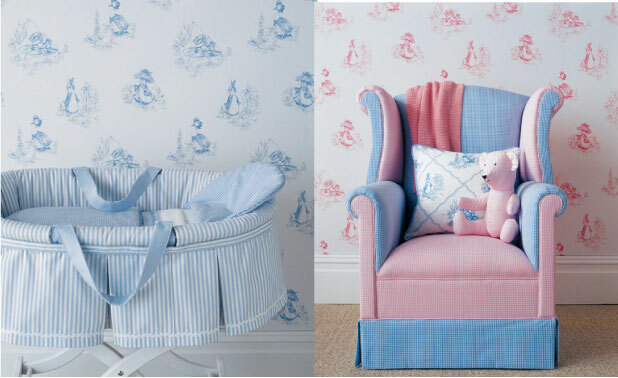 Jane Churchill has a line of children's wallpapers which can make a room instantly sweet and classic. To view more beautiful designs by Jane Churchill visit my post HERE on Project Nursery. The Peter Rabbit theme is too adorable. It's always good seeing nursery themes such as these. Most nurseries now are too sophisticated.